Can you see the eggs in this tree? Not birds eggs, but ladybug eggs. Apparently, a female ladybug can lay 50 to 300 tiny eggs in her lifetime, leaving the yellowish, oblong eggs in clusters of 10 to 50. Just like what we've been seeing all over our apple tree. We've spotted several different types of ladybugs on the tree eating aphids, and avoiding ants, so we're not sure which ones are leaving the eggs, maybe if we're lucky enough to spot some of the ugly little larvae, we'll have a better idea. Ladybug eggs hatch in 3 to 5 days, depending on the weather. The larvae start out small, and then grow for 3 to 4 weeks, as they consume large number of aphids, before entering the pupa stage. We found an apple blossom laden with eggs, and decided to pick it, and bring it inside, in hopes of being able to spot the larvae after they hatch. Right now, they are sitting in a plastic cup, next to our caterpillars from Insect Lore. I have no idea if it will work, or not, but we left enough eggs behind on the tree to take care of the aphids, and keep up the ladybug population, just in case. I'll certainly keep you posted if we see any larvae. I have never seen or at least never noticed ladybug eggs before. You have learned a lot about them this year! I have to say thank you! 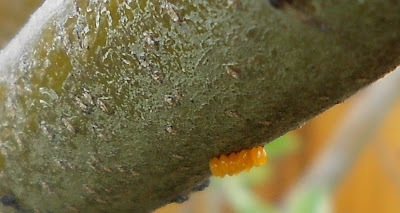 I found some of these eggs on the wood of our rasied garden beds. I didnt know they were ladybug eggs-how neat! I am very happy to learn that they are not the eggs of the tomato worms that attacked our garden last year! I have never noticed ladybug eggs before either. This is fantastic! We got a ladybug raising kit from Insectlore--Ladybug Land. I would totally ask them what to feed the larvae if you get a 2nd generation. I can't wait to see if you're successful. I've seen eggs like those, but never taken them inside. Given my luck it's be somethign horrid.